Looking to conceive? Looks like your partner's New Year's resolution is now "get to the gym!" We all know how important exercise is to living a healthy lifestyle. Not only does it significantly reduce our risk of illness—from common viruses like the flu to more serious health conditions like cancer, diabetes, and heart disease—but it also pumps us with feel-good endorphins that motivate us to live happier, more fulfilling lives. But one new study found that exercise may actually hold the keys to fertility, and not just for the women who are preparing their body to carry a child. Researchers from the journal Reproduction have found that exercise is also important in men who plan to have families, as a lack of physical activity may have a direct effect on sperm quality. The study, conducted at Justus-Liebig University in Germany, analyzed 280 middle-aged men who lived sedentary lifestyles, meaning they rarely exercised. They randomly assigned each of the men to one of three exercise regimens and kept a control group of men assigned to a no-exercise regimen. One group exercised moderately by walking or jogging on a treadmill while the other group did the same activity, just at a higher pace and intensity. Another group carried out high-intensity exercises on the treadmill in short intervals. They followed the men for six months straight to determine the effects of the various types of exercise and levels of intensity to see how it impacted sperm quality and count. When comparing the control group that did not exercise to the rest of the groups of men who followed an exercise program, they found that those who exercised showed significant improvements in their sperm count and quality. After the six-month period, they not only had healthier sperm, but also showed less signs of DNA damage and lower levels of metabolic stress factors. "The results of this study reaffirm once again the powerful benefits that exercise and weight loss have on our overall health," says Philip Werthman, M.D., urologist and director of the Center for Male Reproductive Medicine and Vasectomy Reversal in Los Angeles. "We now know that sedentary men have lower levels of fertility and that, with moderate levels of exercise, we not only lower our body weight and fat, but also improve circulation as well as our overall hormone status. All of these things play a role in increasing testosterone while decreasing in estrogen and producing weight loss and improved sperm quality." It's unclear why the group who exercised moderately showed the most improvement in sperm count and quality, even when compared to the higher-intensity groups. But Dr. Werthman points out that it may have to do with evolution. 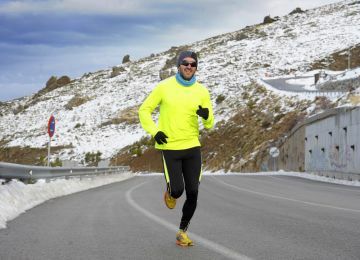 "If we look closer at the evolution of human beings, we are by nature hunters and gatherers, not couch potatoes, however, we also must accept that we're not cheetahs, so walking and jogging, as opposed to sprinting or extended periods of intense exercise, are what's best for our bodies and fertility because these moderate forms of exercise allow the body heat to dissipate faster, helping to maintain the sperms' potency." So if you're exercising to prep your body for a healthy pregnancy, make sure your S.O. tags along.